I didn't know it at the time, but we were really lucky with Pierce because he was a good sleeper. At 3 months he was only waking up once a night, and by 4 months we did a brief stint of 'cry it out' and he started sleeping through the night. And now I'm sure any of the crazies who stumble across this blog will email me belligerently about a.) separating the twins and b.) doing cry it out. It's one thing that put me off blogging...the negativity and judgment of commentary that random people make on blogs. In following others' blogs, I have felt really sad for some of the terrible things readers have said. For this reason, I am screening comments before posting them. Constructive critism is fine...I just don't want nastiness on here. I have a friend that received a trashy comment before even making the blog available to her friends and family - and as a result she has closed all comments. It's tragic that people can't be more supportive of others who are laying their feelings out there. 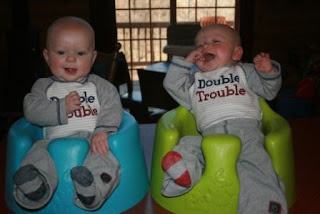 Those Double Trouble outfits are just too cute! I am starting to feel sorry for people who DON'T have twins. Surely the sleep thing will get better someday. I'll start sending up extra prayers for that.